How many of you use your Wireless network or WiFi to access internet? 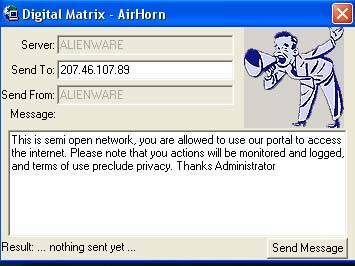 How often you are worried about someone using your wireless network without your permission? Even though we can protect the wireless networks using the WPA/WEP password protection, still it would be great if we can have someÂ way of watching who else is using our network. AirSnare is great tool which alerts you about any unfriendly MAC addresses on your network and will also alert you to DHCP requests taking place. Here by MAC address we mean another system which is accessing your network. If AirSnare detects any unknown MAC address you have the option of tracking the MAC address’s access to IP addresses and ports or by launching Ethereal upon a detection which is included in Airsnare setup bydefault. It can send a email notification to the administrator, can log the connection, and also send a message to the connected machine, informing them that their actions are being monitored. Now comes the bad part. It didnt worked on my Windows 7 64 bit version. It works on XP but i cant say if it will work on vista or Windows 7 32 bit. May be some of you may confirm this to me.